In contrast to the drawn out and stressful recording of “Hemispehres”, Rush has stated that their recording of “Permanent Waves” was more chipper and laid back. It was their first album recorded at Le Studio up in rural Quebec, and sessions were broken up by games of midnight volleyball and drinking. With the band in a less self-conscious state, it’s perhaps no surprise they turned out one of their best and most natural sounding records to date. 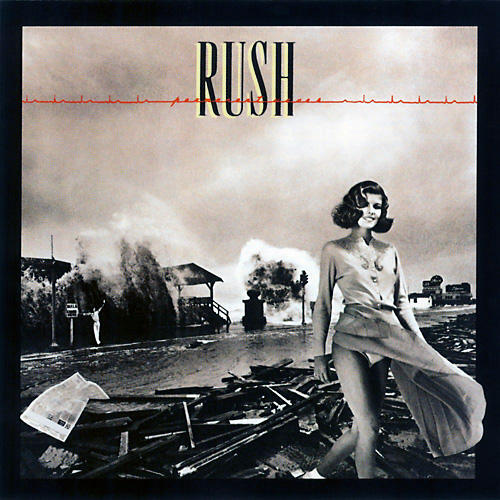 “Permanent Waves” was even shorter than the average Rush record, clocking in at 35 minutes (or the rough length of “Cygnus X-1” in its entirety), rather than the usual 42 a vinyl LP would allow. The band has stated during this era there would usually be a “last minute song” that would present itself towards the end of writing or recording that would fill such a gap, but an absence of such a song is something I don’t mind here. Rush’s last minute songs would sometimes lead to a classic like “Vital Signs” or “New World Man”, but it would also lead to something forgettable like “Madrigal”. So to have the band forego that and just give us the good songs they already had in the can is something I find refreshing. The album opens with the instant classic, fan favorite, and concert staple “The Spirit of Radio”, one of Rush’s seminal tracks. Every now and again (especially around this time), Rush will write what I refer to as a “microcosm” of what represents them as a band, be it through a sound, instrument, or lyrical subject. And this “microcosm” will stand the test of time no matter what stage the band is at in their career or how they’ve evolved musically. “Closer To The Heart” and “2112” were such tracks, and so is “The Spirit of Radio”. This era shows Alex Lifeson getting more wild and experimental with his guitar playing, and flanging riff he busts out during the intro and choruses is one of his best, with some people mistaking it for a synthesizer or sequencer (I know I did at first). It moves from that to a memorable main riff for the song, to sampled concert cheering (replaced by ACTUAL fans cheering when played live), to reggae beats, to Jerry Lee Lewis-style piano playing, all within five minutes. The song title itself is a tribute to Toronto radio station CFNY’s longtime slogan, and the lyrics lament how freedom of choice in music has been limited thanks to exploitation of narrow or perhaps even imagined markets. This theme not only goes back to Rush’s typical championing of the underdog, but is also represented in the aforementioned composition by being a pastiche of all the different styles and tones you would hear flipping through the radio dials. With radio and pop music becoming even more closed off and regimented these days, with rock not even being allowed to make much of an impact on the mainstream airwaves, the song’s message is perhaps more important than ever. Speaking of Rush’s championing of the individual, it finally gets its most direct track yet with “Freewill”, the second song on the album and another fan favorite and concert staple. The lyrics directly mock pride in cynicism, pointing out that “If you choose not to decide/You still have made a choice”, and how deciding for yourself is really the only natural choice in life. The solo section is also one of Alex’s all-time best, and would also be a favorite moment for fans when the song is played live. “Jacob’s Ladder” starts more quietly before building up its ominous tone, with the beat of an almost militaristic march and Geddy’s keyboards sounded like a funeral organ. Even though the length reaches seven minutes, Neil’s lyrics are surprisingly spare, instead letting the composition build before Geddy’s Moog synth and modulated vocals take center stage. The clouds figuratively break at this point and the light shines through, leading the song to its pounding and glorious climax. Because of it’s relative failure as a follow-up single to “The Spirit of Radio”, “Entre Nous” was somewhat shunted for a time by the band. It’s a shame because while it’s not on the level of “Spirit” or “Freewill”, it’s still a really good song. Along with the similarly shunted “Circumstances” though, this song received a revival during the “Snakes & Arrows Tour”. “Different Strings” is more mellow and plaintive, with Alex’s chorusing guitar and piano performed by art director Hugh Syme taking center stage. It’s not bad, but it doesn’t have much energy or a hook to it, even fading out just as Alex starts to noodle out a solo. It’s perhaps no wonder it’s the only song on the album that has never been performed live. To date, this song is the last time Geddy would contribute lyrics to the band, and while they’re probably his best, they’re still nowhere near as good as Neil’s. The album closes with “Natural Science”, Rush’s penultimate 10 minute epic and one of their most evocative. A lyrical exploration of evolution by Neil, it has one of the best beginnings, one of the best builds, and one of the best pay-offs of any Rush epic, sounding almost triumphant by its end. The fact its still a live favorite after all these years is no surprise, though it would be tweaked and re-arranged slightly several years down the line. Compare studio and live versions for yourself to see which you prefer. In the hearts and minds of Rush fans, “Permanent Waves” is right behind “Moving Pictures” and “2112” in terms of seminal albums by the band. Since it’s home to band staples like “The Spirit of Radio”, “Freewill”, and “Natural Science”, it’s hard to argue with them. “Moving Pictures”, however, doesn’t have a weak track on it, and “Permanent Waves” is held back by a few songs that, while good, are nowhere near the level of the songs on its successor. Still, that’s an admittedly high standard to live up to, and “Permanent Waves” is still fantastic in spite of that, so it still comes highly recommended from me. BEST SONG: “The Spirit of Radio”, with “Freewill” right behind it.